For a quick thaw, submerge the salmon package in cool water for 15-25 minutes, or until it has thawed. For best results, thaw in your refrigerator overnight. 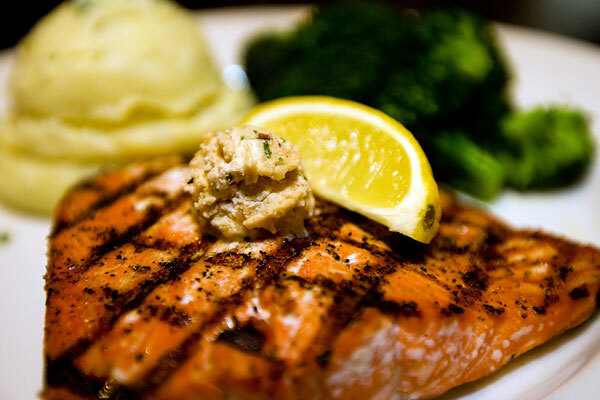 This salmon may also be cooked from a frozen state. Use within 5 days from the time of thaw. Keep refrigerated. 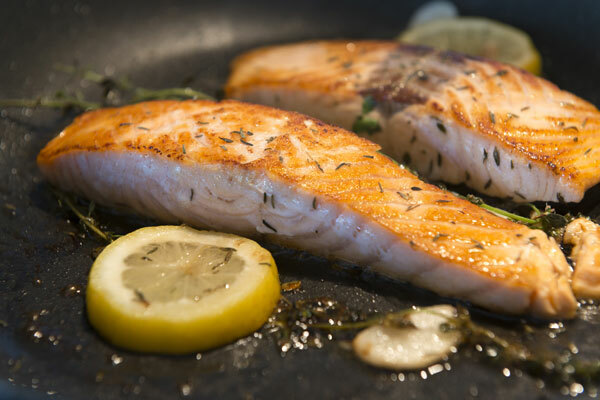 As a general rule, allow 10 minutes of cooking time per inch of thickness, measuring fish at its thickness part. Salmon should be slightly translucent in the middle. Salmon will continue to cook slightly once removed from the heat. Remember, the easiest way to ruin a seafood dinner is to overcook the fish. Preheat oven to 400 F. Cook in a dish between 15-20 minutes, depending on the oven. It is not necessary to turn fish while baking. Preheat grill on high. Briefly sere flesh side of salmon (2 minutes), turn over, skin side down for remaining 8 minutes. (10 minute per inch rule applies). Place salmon in hot skillet, along with marinade if desired. Sauté 4 minutes, flip salmon over, cover pan and cook another 7-9 minutes. Let stand for 2-3 minutes. from the heat for 7-10 minutes or until done. Preheat over to 375. Rinse and pat salmon portions dry. Place in glass and cover dish with milk. Cover with plastic wrap and put in the refrigerator for 30 minutes. Line baking sheet with foil. Remove salmon portions from milk and pat fry. Place skin side down on foil. Sprinkle with salt and pepper. Combine panko, cranberries, onion, 2 TBS butter, thyme and lemon pee; blend well. Season with salt and pepper. (It will be dry). Spoon onto salmon and press to adhere. Drizzle with remaining butter. Bake until top is golden and salmon is opaque in the center, 20 to 25 minutes. Place all ingredients into a blender and mix until the onion is pulverized, about 2 minutes. Pour over fresh salmon fillet (skin side down) and marinate for a minimum of 2 hours. Grill on med/high heat approximately 8 – 10 minutes. Mix together all the ingredients, shape into miniature patties and fry in olive oil until lightly browned. Serve with rice and chutney as a condiment. Delicious! The salmon cakes can be made ahead of time and frozen enabling you to grab them from your freezer for a quick meal. Combine all ingredients in a small bowl. Mix well. Lay salmon fillet skin side down in a large baking dish. Spread olive mixture evenly over the top of the salmon. Bake for approximately 20-30 minutes, until fish barely flakes. (Salmon will continue to cook after it is removed from the oven.) Serve hot. Blend together all ingredients with food processor or electric mixer. Spoon mixture into bowl, cover and refrigerate. Bring to room temperature 30 minutes before serving with crackers or bread. In a shallow glass or ceramic dish large enough to hold the salmon in a single layer, combine the marmalade, soy sauce, vinegar, ginger, sesame oil, garlic, salt and pepper. Add the salmon, turning it to coat. Cover and marinade in the refrigerator for 30 minutes – two hours. Preheat broiler. Lift the salmon from the marinade, transfer to the broiler pan and spoon the marinade over the fish. 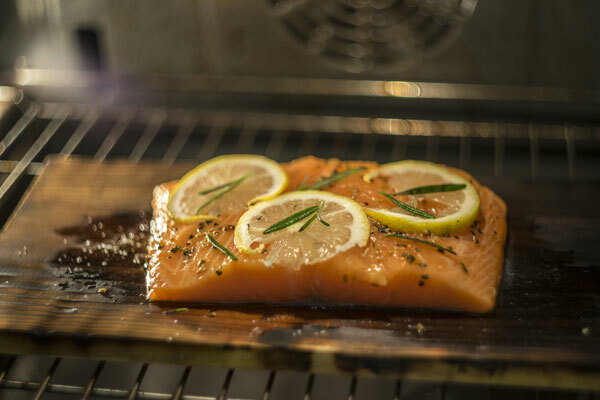 Broil 4 – 6 inches from the heat for 3 – 4 minutes per side or until salmon flakes when tested with a fork. Remove the salmon skin before eating. Serves 4. Mix lemon juice into the broth. Place the salmon in a shallow glass pan. Pour the bouillon and lemon juice over the salmon. Marinate, covered in the refrigerator for at least two hours, turning the salmon occasionally. Cook bacon in 3 quart saucepan until crisp. Drain, reserving fat in saucepan. Cook and stir onion, celery and mushrooms in bacon fat until celery is tender. Stir in flour, mustard and rosemary. Cook over low heat, sting constantly, until bubbly; remove from heat. Stir in wild rice and broth. Heat to boiling; reduce heat, cover and simmer 10 minutes. Stir in bacon, half and half and salmon. Heat, stirring occasionally until hot. Serves 6. 280 calories per serving.